1. Do have an idea that you really do want to share. I don’t think anyone should want just to do a public presentation, they should need to share something, and it can be anything – we heard about flesh eating parasites, the power of climbing trees, and the importance of bearing witness to grief. However each of the talks had a point to them, they weren’t just a meditation on a subject. 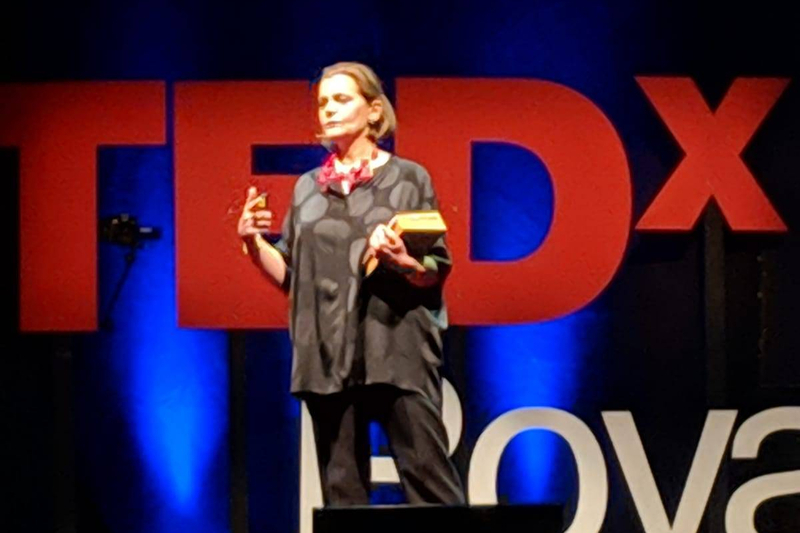 Thinking hard about the one thing I wanted people to do as a result of hearing me speak – to realise that the words we use everyday can have an impact – really helped me prepare. To be honest, my first draft was just a lecture about dictionaries. 2. Read a book. YAY! Who even needs an excuse? The two how-to books I found particularly helpful were Viv Groskop’s book How to Own the Room and Caroline Goyder’s Gravitas. There’s also the ‘bible’ – Chris Anderson’s TED talks. 3. Do voice exercises as part of early preparation. I’m used to reading my work on stage but even so, I always find that my breath goes higher and higher up my body when I get nervous so I end up squeaking even more than usual. What worked for me most was when my actor friend, Michael Shaeffer, suggested I concentrated on the consonants rather than the whole words. Amazingly something as simple as this helped stop my words running into each other AND made me feel more purposeful. It’s so strange how it works, almost as if Michael knows what he’s talking about. We also practiced reading in different accents, the more ridiculous the better. Laughing took away some (not all) of the panic because it felt playful, and this playfulness helped to give me back my voice. 4. Edit, edit, edit so your script is easy to understand. One of the useful points made in Gravitas is to make sure you know exactly how your points link to each other. I’m used to writing for the page so I found I twisted and turned all over the place in my first draft, coming back to certain points again, digressing into others. That’s OK on the page because people can refer back to the paragraph before, but not when it’s being spoken. And when I found myself freezing, it was always when there wasn’t that clear link between one point and the next. I also took away several of the million points I felt I absolutely had to make and guess what – I didn’t miss them. 5. Make the language fluid, and fluent. Reading it out aloud (not just in my head) was the best editor I could have had. I kept asking myself, could I make this easier for myself to read? And every time, I could. I wasn’t quite at ‘unaccustomed as I am to…’ levels but my early drafts did get perilously close to a sermon written by the most pompous vicar you’ve ever heard. 6. Use all the resources available. I was so lucky because the whole team behind Tedx RTW are AMAZING. Just knowing I could call on them was such a comfort, so if you’re doing a talk, then make the most of what the organisers of the event are offering. They are the professionals, they know exactly what they’re doing – and when to do it! 7. Respect your audience. Imagining the audience naked or on the loo doesn’t work for me BUT thinking that every seat was occupied by someone who wanted me to do well was a great help. I think there’s a temptation, especially when you’re nervous, to imagine you are about to enter a gladiator ring with the audience baying for blood (!) so instead I concentrated on how I might explain it to my mum instead, knowing she’d be interested and on my side but still needed to know what it was I was actually on about. She wouldn’t have let me get away with just mumbling, and besides I wanted her to know what I was saying. 8. Rehearsals are for failing. During the proper technical rehearsals on Friday, I froze, couldn’t remember my words on my first attempt, and actually walked off stage during my second. Reassuringly we were all the same. However, on the actual day everyone was fluent and got through without stumbling – I’m sure there was some magic involved. 9. Practise, practise, practise. I’ve never learnt a script like this before, and for weeks I have been walking around mumbling to myself. I’ve woken up reciting it, recorded myself as I’ve run, performed it to friends via Skype. Only to find that half an hour before I went on stage I COULDN’T REMEMBER ONE WORD. Not one. I thought I might actually die. But muscle memory is a marvellous thing – as soon as I was on stage and I’d said my first sentence, the next came. And the next. I don’t know exactly how it works, but I do know it was as a result of all that mumbling. No amount of practising is ever too much. 10. Remember it’s you speaking, and that you’re enough. As I said, my first draft was a rather turgid lecture albeit filled with hundreds of ‘interesting’ facts other people had found out, and with very little of me in it. Thinking how I would say this to a friend I’d just met up with was helpful – did I really need to go through the whole history of every word ever spoken in order for her to believe me? So once I had my ‘bones’, I went back through and added as much of ‘me’ in it as I could, even if it meant giving up the ‘expert’ role. There is a terrific vulnerability in that. I went through hours of sweating over all that unhelpful ‘who am I to say this’ stuff that the inner critic loves so much. But, going back to point 1 here, ‘Do have an idea that you really do want to share’ made me see that just getting across why I loved and cared about words was enough. then I’d rather it didn’t happen. I’ll just leave now before we both regret. I won’t do it. It’ll become too hard. and it’s more than perfect, it’s sublime. I’m already longing for the next time. John and I met properly through The Poetry Exchange, so do listen to some of the podcasts there if you are longing for some poetry discussions over Christmas! So lovely to hear Jilly Cooper on the radio this morning, talking about dogs, OF COURSE! It made me nostalgic for discovering her books for the first time, just getting lost in a book that didn’t make me cry, for once. I wouldn’t hide her books now, that probably said a lot about the pretentious moi of that time, so here’s a poem I wrote about her last year. I could have been the one to cure him. that book to hide yours in when I first found you. women get things so hopelessly wrong? And still live? fistfuls of waist compared, good intentions started. with husbands curiously maimed. But not your women. when I got things wrong. I liked it. I liked them. still alive, you were laughing about it all too. I loved, but knowing all along it was you.